Need some colorful garden fantasies to help while away these grayer winter days? Get out your scratch paper and begin sketching the plans for colorful container designs that will add instant color to your spring gardens. We love container gardens here at Lifescape Colorado; they’re beautiful, portable (helpful when late spring storms arise) and also offer a fun and creative way to add focal points to your outdoor landscape. This will yield containers that are well balanced, so each plant has its own space to shine. Here are three container plants that will add interest to your spring garden as well as some creative container ideas for their display. Snapdragons. This is a perky, upright grower and snapdragons can be found in practically any shade you desire, as well as a few different bloom shapes. They prefer the sunnier side of life. 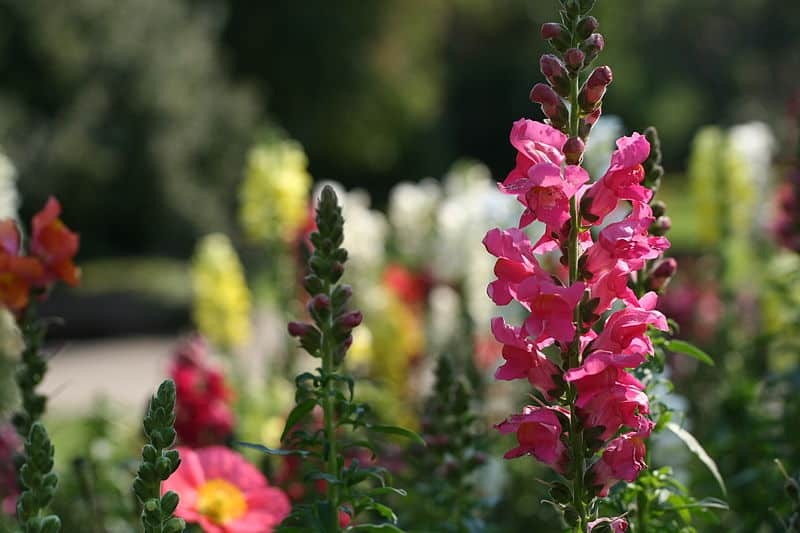 If well-cared for, you might even be able to coax snapdragons through a hot summer and into the fall. They make a great center-piece in your container, surrounding by lower or draping plants around the edges. Petunias. There are many reasons to love petunias, from their bright and bold color displays to the way they attract beautiful moths after dark. Look how the red, pink and purple petunias contrast with this green-blue vessel. Once the sun sets, safety lighting built-in to the hardscaping will attract beautiful moths to their blooms. You can also keep it simple by using a monochromatic palette, like we did with this container arrangement. Flowering Kale and Cabbages. Since spring weather can be touch and go, flowering kale and cabbages are a safe and colorful bet for containers because they can tolerate colder temperatures. Use them for lower-profile areas and keep an eye out for ornamental varieties that add reds, pinks and whites. Don’t let your creativity end with the plant selections. The containers you select are just as important as the blooms and dimensions you create inside them. Rather than purchasing new pots and vessels, we recommend looking around or shopping at thrift stores for unique items that can be converted into containers. Just about anything can be re-purposed into a container if you put your artistic mind to it. Lifescape is here whether you would like help designing your containers or to provide regular maintenance so they look their best year-round. Contact us to schedule a consultation.